In early 2017 the United Nations (UN) declared that Yemen was enduring the single largest humanitarian crisis in the world. By year’s end, UN agencies estimated that 17.8 million people in Yemen were food insecure and 8.4 million were at risk of famine. Economic and public service collapse left more than 16 million Yemenis without access to safe water and sanitation, and 16.4 million without proper healthcare. All of these factors played into an outbreak of cholera in 2017 that surpassed 1 million suspected cases by December – the largest cholera epidemic ever recorded in a single year. The UN’s 2017 humanitarian appeal for Yemen amounted US$2.3 billion, of which the international community had funded 70.5 percent by year’s end (see ‘Humanitarian Developments’ below for details). In response to this crisis, the United Nations Security Council (UNSC) held a combined nine briefing and consultation sessions related to Yemen in 2017, during which no new resolutions were adopted and one Presidential Statement – a council product less weighty than a resolution – was issued. Ismail Ould Cheikh Ahmed, who as United Nations Special Envoy to Yemen heads UN efforts to end the conflict that is driving the humanitarian crisis, initiated no new peace talks between the warring parties during this time. While no party to the conflict appeared receptive to peace overtures in 2017, the Houthi leadership and then-allied forces of former President Ali Abdullah Saleh stated early in the year that they felt the Special Envoy was biased against them and could not be a fair peace arbiter. However, deterred neither by this nor by the numerous broken ceasefires and failed peace negotiations that the Special Envoy presided over in 2015 and 2016, in 2017 UN Secretary-General António Guterres and UNSC member states regularly reiterated their support for Ould Cheikh Ahmed and his efforts toward resolving the conflict. UNSC member state representatives, UN officials, and diplomats speaking privately with the Sana’a Center in 2017 consistently noted the same primary causes of UNSC inaction regarding Yemen: Saudi Arabia, the United Arab Emirates (UAE) and other partners in the regional military coalition intervening in the Yemen war – among them Egypt, which sat on the UNSC in 2017 – assertively pressured UNSC member states not to take actions the coalition deemed unfavorable, with other nations generally apprehensive about antagonizing Saudi Arabia and the UAE. The United States (US), United Kingdom (UK) and France – all veto-wielding permanent UNSC members, as well as the Saudi-led military coalition’s primary arms suppliers – have also quashed attempts at the UNSC to restrain the coalition or to implicate its members in war crimes. Representatives from other UNSC member states told the Sana’a Center in 2017 that the council had thus exhausted all plausible options for action regarding Yemen and had essentially been reduced to an observer of the crisis (see ‘At the United Nations’ below for details). In the US, former President Barack Obama’s official exit from the White House in January 2017 marked the end of the outgoing administration’s last-ditch effort to end the Yemen war. It ushered in a new era of US belligerence regarding Yemen, and the world generally, under President Donald Trump. However, there are two pillars of the previous administration’s Yemen policy that Trump has not only upheld but in fact championed during his inaugural year in office. One is steadfast US support for the Saudi-led military coalition. Trump has shown renewed zeal for arms sales to US allies in the Gulf. The new US administration has also fully adopted – and spent considerable energy propagating – the Saudi narrative that the Houthis are Iran’s “proxy terrorist group” (see ‘In the United States’ below for details). The second Obama-era policy continued by the Trump administration is a myopic focus on military firepower to counter al-Qaeda in the Arabian Peninsula (AQAP) rather than programs addressing the socio-economic and political accelerants of extremism. This passing of the torch between presidents was epitomized just days after Trump entered the White House when he signed off on a US Navy SEAL raid – planned when Obama was still in office – against a suspected AQAP hideout in Yemen’s al-Bayda governorate. Casualties of the raid included 25 civilians – nine of them children under the age of 13 – and a US commando (see ‘AQAP, Daesh and Counterterrorism Operations’ below for details). In other international diplomatic developments in 2017, the European Union (EU) and individual EU member states intensified their engagement with Yemen, from pursuing track II negotiations with Yemeni tribal leaders and supporting the humanitarian campaign to calling for an arms embargo on Saudi Arabia. In the Middle East, Saudi Arabia, the UAE, Bahrain, Egypt and the Yemeni government abruptly severed diplomatic ties with Qatar in June, imposing travel and trade bans and expelling Doha from the Saudi-led military coalition. Moscow, meanwhile, continued to operate the last foreign diplomatic mission in Sana’a – other than the Iranian embassy – through most of 2017. This ended in December, however: the Russian embassy closed following the Houthi killing of former President Saleh (see ‘Other Regional and International Diplomatic Developments’ below for details). In Yemen, both the conflict and humanitarian crisis dramatically escalated toward the end of the year. This began in early November when Houthi forces fired a ballistic missile towards Riyadh’s King Khalid International Airport. Saudi officials claimed the missile had been smuggled into Yemen from Iran. In response the Saudi-led military coalition ordered the closure of Yemen’s sea and air ports to all aid and commercial traffic. This sparked price surges and shortages of fuel and basic commodities across the country (see ‘Humanitarian Developments’ below for details). Weeks later the conflict took another startling turn when the alliance between the Houthis and Saleh violently collapsed in late November, with the Houthis then killing Saleh in early December. Saleh was the most prominent Yemeni political figure of the last four decades; for years he weaved sprawling networks of power, patronage, influence and money across the country, around the region and throughout the world. The death of arguably the most connected and most corrupt man in Yemen is widely understood to have made a negotiated settlement to the conflict far harder to achieve. Following Saleh’s death, the Houthis consolidated control in Sana’a and areas of the country’s north that they had co-managed with Saleh’s General People’s Congress party (GPC) since 2015. Saleh’s death precipitated the disintegration of the GPC, eliminating the Houthi’s primary competition in northern Yemen in the plunder of state revenue streams. The Houthis also carried out a targeted campaign of mass arrests and enforced oppressive new security measures throughout December. Key Saleh loyalists whom the Houthis were unable to arrest either went into hiding or fled to Marib and other areas controlled by the forces associated with Yemen’s internationally recognized government (see ‘Collapse of the Houthi-Saleh Alliance and Saleh’s Death’ below for details). Throughout 2017 the authority of President Abdo Rabbu Mansour Hadi and the Yemeni government weakened in many areas across the country’s south that they purportedly controlled, even as forces nominally fighting on the government’s behalf made moderate battlefield gains at both the beginning and end of the year. Public protests over failing public services repeatedly erupted in Aden, the government’s de facto capital in southern Yemen. Hadi and his cabinet, who largely operated from Riyadh throughout 2017, were widely panned as corrupt and inept. Tensions between armed factions in the city – primarily Yemeni government-affiliated troops and various UAE-backed local forces – also regularly erupted in clashes. This, coupled with several spectacularly violent terrorist attacks, produced in Aden a profound sense of insecurity. Further undermining the Hadi government were various new political and military actors whose influence expanded across southern Yemen in 2017. The Southern Transitional Council (STC), for instance, formed in May with the explicit goal of seceding South Yemen from the greater Yemeni republic; by December the STC had representative offices across the south. In attempts to quash the council, President Hadi had sacked seven governors for their association with the STC by year’s end. Importantly, the UAE – ostensibly a Hadi ally through its participation in the Saudi-led military coalition – actively supported the STC. Abu Dhabi’s other interventions have included funding, training and arming local paramilitary groups that increasingly challenged Yemeni government troops for dominance in several southern governorates as well as the northern governorate of Taiz. Meanwhile, relatively successful models of self-governance in Marib and Hadramawt last year empowered local political leaders to demand that the Yemeni government officially sanction their increased autonomy (see ‘Fragmentation Amongst Anti-Houthi Forces’ below for details). In frontline developments, coalition-backed forces launched “Operation Golden Spear” in January 2017, advancing northward along Yemen’s western Red Sea coastline to seize Mokha port in Taiz governorate from Houthi-Saleh forces. Further progress stalled, however, with frontlines around the country remaining essentially static for most of the rest of the year; until December the only notable coalition achievement was the capture of Khalid bin al-Walid military base in Taiz governorate after a prolonged siege. Following Saleh’s death in December, however, coalition forces moved north of Mokha to seize Khokha district in Hudaydah governorate, while also gaining territory in Shabwa, al-Bayda and al-Jawf governorates. These territorial losses for the Houthis at the end of 2017 were significant only in so far as they constituted frontline movements after prolonged stalemate. In the overall military dynamics of the Yemen war, a decisive military victory for any side remained a remote possibility as 2018 began (see ‘Frontline Developments’ below for details). Among the most significant military developments of 2017 was the preemption of a Saudi-led military coalition assault on the Houthi-held Red Sea port of Hudaydah. Throughout the first quarter of 2017 Saudi Arabia and the UAE lobbied their allies in Washington, D.C., to approve direct US military support for a coalition assault on Hudaydah. The coalition has long claimed that Iranian weapons are being smuggled to Houthi forces through Hudaydah port – a claim widely disputed by UN agencies. Critics of the proposed assault pointed to how it would dramatically exacerbate Yemen’s humanitarian crisis, given that Yemen imports nearly all its food supplies and that the vast majority of these supplies – both commercial and humanitarian – arrive through Hudaydah port. The possibility of an attack on the port thus dominated foreign policy discussions regarding Yemen in the US, at the UN and throughout much of the international community in March and April. However, by late April, intense opposition within the US Congress, at the UNSC, and throughout the international humanitarian community appeared to prevail: the US administration took a tentative stance regarding the attack and the Saudi-led military coalition eased off the rush to launch it (see ‘Operation Golden Spear and Hudaydah Port’ below for details). A consistent aspect of the conflict since the beginning has been the lack of respect for the laws of war. As stated by a UN Panel of Experts report in January 2017, all the belligerent parties have carried out “widespread violations” of international humanitarian and human rights law. This trend continued through 2017. Houthi-Saleh forces, Yemeni government troops, the Saudi-led military coalition and affiliated ground forces, as well as various non-state actors regularly attacked civilians and civilian objects, launched indiscriminate attacks, carried out arbitrary detainments and torture, used banned weapons, impeded humanitarian aid and access, starved civilian populations, and carried out forced displacements, among other violations of international humanitarian and human rights law. A significant development regarding accountability in 2017 was the UN’s annual Children and Armed Conflict report including Saudi Arabia on its list of actors guilty of grave violations against the rights of children. This listing was based upon Riyadh’s conduct during the Yemen war. Saudi Arabia had initially been named to the list in 2016, but was removed after threatening to withdraw hundreds of millions of dollars in funding for UN aid programs. While Houthi-Saleh forces, Yemeni government troops, coalition-backed militias and AQAP were all again named to this year’s report, Saudi Arabia was included in an amended category that recognized its attempts to address issues the report raises. Another accountability development came in September when the UN Human Rights Council approved a resolution to establish of a group of experts to investigate human rights violations by all parties (see ‘Human Rights and War Crimes’ for details below). Yemen’s economy continued to contract through 2017. The Ministry of Planning and International Cooperation reported that Yemen’s gross domestic product (GDP) shrank 14.4 percent year-on-year, signifying a 40.5 percent loss in GDP since 2015. The value of Yemen’s domestic currency, the rial, was consequently battered: in January 2017 the average market exchange rate for the Yemeni rial (YR) against the US dollar was YR 321 to US$1, according to Central Bank of Yemen (CBY) figures; as December ended, the rial was trading in the range of YR 460 to US$1. Relative to March 2015, when the conflict began and the rial was trading at YR 215 to US$1, the cost of purchasing dollars on the market had increased 114 percent (see ‘Economic Developments’ below for details). Given that Yemen imports up to 90 percent of its basic foodstuffs this currency depreciation has decimated local per capita purchasing power. The inability to purchase available food – rather than the unavailability of food to purchase – is driving the country toward mass famine. This negative trend has been further compounded by the widespread loss of livelihood and paid employment. As 2017 ended, most of Yemen’s 1.2 million civil servants had received only a fraction of their salaries since September 2016. Meanwhile the UN Office for the Coordination of Humanitarian Affairs reported in December that commercial businesses had, on average, cut operating hours by half since the conflict began, with layoffs estimated at 55 percent of the workforce. In 2017 the United Nations Security Council (UNSC) held nine briefings and consultations on the situation in Yemen. Besides a routine measure renewing the sanctions regime (resolution S/RES/2342 (2017)), it passed no new resolutions regarding the country. In June, however, the UNSC adopted Presidential Statement S/PRST/2017/7 – the first Security Council product related to Yemen to emerge in 14 months. Importantly, a Presidential Statement holds less weight than a UNSC resolution, while this particular Presidential Statement also lacked language mandating enforcement. Speaking to the Sana’a Center for Strategic Studies, UNSC member states and Security Council observers said the council’s prolonged silence regarding Yemen – site of the world’s largest humanitarian crisis – had become untenable. As the situation in Yemen continued to deteriorate, lobbying intensified by non-governmental organizations, United Nation (UN) agencies, and some UNSC member states. While the United Kingdom (UK), as council pen-holder for Yemen, was ultimately responsible for drafting the presidential statement, the process of shaping the language and content of the text elicited ministerial-level involvement from various UNSC member states. Among other deliberations and negotiations in drafting the wide-ranging document, the Swedish delegation lobbied for the inclusion of the clauses insisting that the warring parties distinguish between military and civilian targets; the Italian mission pushed for language regarding allowing humanitarian access through Hudaydah port; the Russian delegation forced language to be cut from the document that condemned the Houthis for not meeting with the Special Envoy while he had been in Sana’a in May; and the Egyptian mission attempted to scrap language specifically referring to the installation of cranes at Hudaydah port and the opening of Sana’a Airport to commercial flights, though in the end they accepted the inclusion of language referring to the cranes (see ‘Humanitarian Developments’ for details below). UNSC member states also told the Sana’a Center that Saudi officials, including the foreign minister, heavily scrutinized and weighed in on the language of the statement through the Egyptian mission to the UNSC. Even before it was adopted, the feasibility of various aspects of the presidential statement was in doubt. For instance, in the presidential statement the UNSC reiterated its continued support for the efforts of UN Special Envoy to Yemen Ismail Ould Cheikh Ahmed to broker peace, and it called on the warring parties to engage with the Special Envoy’s proposals. This came, however, just 10 days after one of the most senior Houthi officials in Sana’a had condemned Ould Cheikh Ahmed and banned him from ever returning to Yemen (see ‘The UN Special Envoy for Yemen and the Peace Process’ below for details). In addition, within two days of the presidential statement calling for the warring parties to distinguish between military and civilian targets, the Saudi-led coalition, for the second time in 2017, bombed a market in northern Yemen, killing 23 civilians (see ‘Human Rights and War Crimes’ below for details). The UNSC last adopted a new resolution regarding Yemen in April 2015: UNSC Resolution 2216, which the Saudi-led military coalition has since used to legitimize its intervention in the conflict. Security Council members expect no new resolutions regarding Yemen in the near future. Throughout 2017 three permanent members, namely the United States (US), UK, and France, continued to back the coalition through arms sales worth billions of US dollars. The US also continued to provide technical, intelligence, and air refuel support to the Saudi-led military coalition. While several non-permanent UNSC member states have at different times expressed an interest in proposing new resolutions and pursuing more assertive council actions regarding Yemen, these efforts have all been derailed. The veto-wielding US and UK missions to the UNSC have consistently blocked proposals that would restrain the Saudi-led military coalition; Saudi Arabia and the United Arab Emirates (UAE) have lobbied assertively and effectively for the same, and acted by proxy at the UNSC through the Egyptian mission. Egypt’s rotating term on the council ended, however, in December 2017. Going forward Kuwait, which took up a council seat in January 2018, is expected to champion the coalition position. Like Egypt, Kuwait is a coalition member. Throughout 2017 the Russia representative to the UNSC has appeared somewhat at odds with the positions staked out by the US, UK, and France. Russia has arguably remained a neutral party throughout the Yemen conflict, maintaining open lines of communication with all parties to the conflict (see ‘Other Regional and International Developments’ below for details). Russia is the only UNSC member to have abstained during the 2015 vote on UNSC Resolution 2216, which the Russian mission described as “imbalanced” and lacking the stipulation for ceasefire requested by Moscow. At various times throughout 2017 Russia spotlighted the Houthi perspective during UNSC discussions, arguing that the council ought to take a more considered approach. In December 2017, rotating UNSC membership ended for six countries: Egypt, Italy, Japan, Senegal, Ukraine, and Uruguay. Six new members joined the council: Côte d’Ivoire, Equatorial Guinea, Kuwait, Netherlands, Peru, and Poland. Having chaired the 2140 Yemen Sanctions Committee for the previous two years, Japan handed the chairmanship to Peru. In 2017 Ismail Ould Cheikh Ahmed entered his third year as United Nations Special Envoy for Yemen, leading the UN’s efforts to bring about a negotiated end to the conflict. Throughout 2015 and 2016 the Special Envoy had presided over several rounds of unsuccessful peace talks and ceasefires that failed within days; in 2017 he was unable to bring the warring parties to the negotiating table at all. In December 2016 Ould Cheikh Ahmed had put forward a peace proposal that Yemeni President Abdu Rabbu Mansour Hadi had immediately and outright rejected. The next month Ould Cheikh Ahmed had entered a period of shuttle diplomacy around Middle Eastern capitals in an attempt to garner support for that same proposal, but to no greater success. As reported by the UN 2140 Sanctions Committee Panel of Experts at the end of that month, no side in the conflict had “demonstrated sustained interest in or commitment to a political settlement or peace talks.” Forces affiliated with the Yemeni government and the Saudi-led military coalition backing it sought to capitalize on battlefield gains early in 2017 (see ‘Operation Golden Spear and Hudaydah Port’ below for details). This, coupled with the a new and far more belligerent White House administration backing the coalition (see ‘In the United States’ below for details), heavily disincentivized the Hadi government and coalition member states from genuinely engaging with the Special Envoy. On the other side of the conflict, the Houthis and then-allied forces of former President Ali Abdullah Saleh made it clear early in 2017 that they no longer trusted Ould Cheikh Ahmed to be a fair arbitrator. In February a high-ranking Houthi official submitted a letter to UN Secretary-General António Guterres requesting that he not renew the Special Envoy’s term, claiming that Ould Cheikh Ahmed had shown a “lack of neutrality” and was biased toward the Saudi-led coalition. In May the Special Envoy went on a three-day visit to Sana’a to discuss his plan to avert a possible coalition attack on the Red Sea port of Hudaydah (see ‘Operation Golden Spear and Hudaydah Port’ below for details). This proposal involved Houthi-Saleh forces turning port management over to third-party security and financial committees. However, no senior leadership from either the Houthis or the Saleh-allied General People’s Congress (GPC) party agreed to meet with Ould Cheikh Ahmed. The Special Envoy would also later describe in a UNSC briefing that his convoy was attacked and an assassination attempt made against him on the same trip. The following month, Saleh Ali al-Samad, the President of the Houthi-Saleh Supreme Political Council, declared that the Special Envoy was “not desirable for future peace negotiations,” and barred Ould Cheikh Ahmed from future entry into Houthi-Saleh controlled areas. At various times throughout the rest of 2017 the Special Envoy met with officials from the US, Europe, and the Gulf. He gave briefings to both the UNSC and the so-called Quint – a multilateral group of foreign ministers from the US, UK, Saudi Arabia, UAE, and Oman. Ould Cheikh Ahmed generally used his public speaking events to highlight the plight of Yemenis, the need for the international community to respond, the inability of any side to win a decisive military victory, and the lack of progress toward a negotiated settlement to the war. Throughout, the UNSC and UN Secretary General regularly reiterated their support for the Special Envoy’s efforts. January 26: In a UNSC briefing UN Emergency Relief Coordinator Stephen O’Brien says, “The conflict in Yemen is now the primary driver of the largest food security emergency in the world,” and warns of the likelihood of famine in 2017. January 27: The UN 2140 Sanctions Committee Panel of Experts meets to discuss the panel’s report, which states that neither side in the conflict has “demonstrated sustained interest in or commitment to a political settlement or peace talks.” The report also finds that all parties to the war in Yemen are implicated in “widespread violations” of international humanitarian law. February 10: A high-ranking Houthi official submits a letter to UN Secretary-General António Guterres, requesting that Guterres not renew the term of the UN Special Envoy. March 17: The UNSC issues an “elements to the press” to express concern over the possibility of a Saudi-led military coalition attack on Hudaydah port – Yemen’s primary entry point for humanitarian and commercial imports – given the extreme likelihood of catastrophic humanitarian fallout across the country. Notably, no UNSC member state goes on record as saying the assault should not take place. March 17: Special Envoy Ould Cheikh Ahmed concludes a four-day European tour. March 21: The UN refuses a Saudi request to assume jurisdiction over Hudaydah port, with UN spokesperson Farhan Haq saying, “Parties to the conflict have a clear responsibility to protect civilian infrastructure and fundamentally to protect civilians. These are not obligations they can shift to others.” The Saudi request came after an incident on March 16 in which a coalition attack helicopter repeatedly strafed a boat near Hudaydah port carrying Somali refugees, killing at least 43 people (see ‘Human Rights and War Crimes’ section below for details). April 4: In an attempt to stave off massive funding cuts by the US administration, the UN appoints South Carolina Governor David Beasley, a politician loyal to US President Donald Trump, to head the World Food Programme (WFP). June 15: The UNSC adopts a wide-ranging presidential statement highlighting key aspects of the Yemeni crisis. It is the first UNSC decision regarding Yemen in almost 14 months. July 12: In a briefing to the UNSC, Special Envoy Ould Cheikh Ahmed highlights the escalation of violence in many areas of Yemen; the warring parties’ continued targeting of civilians and civilian infrastructure; the escalating cholera epidemic; rampant food insecurity; and widespread economic hardship. Early August: The Yemen Sanctions Committee receives its midterm annual report from the Yemen Panel of Experts. The report finds that coalition forces, contrary to obligations under the sanctions regime, have not reported cargo ship inspections since UNSC Resolution 2216 was adopted more than two years earlier. The report adds that this lack of reporting impairs safeguards included in the sanctions regime that are meant to prevent the coalition from leveraging sanctions to achieve other objectives, and that this has impeded the delivery of humanitarian aid. August 21: The UNSC holds an Arria-formula meeting entitled, “The Vital Role of the UN’s Humanitarian Assistance Partners in the Crisis in Yemen.” Following the briefing, the UNSC issues ‘press elements,’ the weakest form of official Security Council statements, reiterating the need for access to Hudaydah and condemning the missile attack on Riyadh. September 19-25: During their time to speak at the September United Nations General Assembly Debate, more than two dozen heads of state highlight the plight of Yemenis and the need to end the conflict. October 10: The Special Envoy gives an open briefing to the UNSC where he expresses concern over the sharp increase in civilian casualties. He urges all parties to uphold their obligations under international humanitarian law. November 4: The Houthis fire a ballistic missile at King Khalid International Airport in Riyadh (see ‘Human Rights and War Crimes’ for details below). November 6: The Saudi-led military coalition imposes a blockade on all land, sea, and air ports into and out of Yemen (see ‘Humanitarian Developments’ for details below). By mid-month the coalition has reopened ports in southern Yemen under Hadi government control. November 16: Fifteen international nongovernmental organizations and UN agencies issue a press release expressing “outrage” at the continued Saudi-led military coalition blockade of northern Yemen. November 18-20: The UN Panel of Experts visits Saudi Arabia to investigate recent Houthi missile attacks. November 23: The coalition begins allowing limited humanitarian access for UN cargo to Sana’a International Airport and Hudaydah Port, while continuing to block commercial cargo deliveries. December 20: The Saudi-led military coalition announces that it will allow Hudaydah port to reopen to commercial cargo deliveries for 30 days. December 22: The UNSC releases a press statement condemning in the strongest possible terms the Houthis’ continued ballistic missile attack on Riyadh. The council also expresses its concern over the continued non‑implementation of council resolutions, including Resolution 2216 (2015). The end of the administration of US President Barack Obama in January 2017 marked the collapse of a last-ditch peace push by outgoing US Secretary of State John Kerry. The collapse of this effort foreshadowed the wider withdrawal of the US from the peace process in Yemen in 2017 – and, under the new administration of President Donald Trump, a more belligerent stance in the world generally. During private conversations with UNSC member state representatives and other UN sources in March 2017, the Sana’a Center found that the new US administration was generally expected to erase any diplomatic detente engendered by Yemen peace negotiations since 2015. UNSC member states also foresaw the new Trump White House embracing the Saudi and Emirati narrative that the Houthis are Iranian proxies, akin to Hezbollah in Lebanon. Yemen’s internationally recognized government had a similar assessment, welcoming the new US president and the prospect of increased US military support, while in parallel, Yemeni President Abdo Rabbu Mansour Hadi showed decreased interest in engaging with the UN Special Envoy in the peace process. While abandoning one aspect of the Obama administration’s Yemen policy – peace arbitration – Trump has doubled down on two other strategies pursued by the previous president: stalwart support for the Saudi-led military coalition and a myopic focus on military firepower in countering al-Qaeda in the Arabian Peninsula (AQAP), rather than addressing the socio-economic and political accelerants of extremism. Just days after coming into office, Trump approved a US Navy SEAL raid in Yemen’s al-Bayda governorate. Death tolls from the scene varied slightly; however, villagers report 25 civilians killed, including 9 children under the age of 13. AQAP reported 14 members killed, while the US Navy reported that one commando was killed, four were wounded, and a $70 million US Navy Osprey aircraft was destroyed. The White House press secretary dubbed the event a “successful operation by all standards.” This – and at least six drone strikes in Yemen authorized by Trump during his first 10 days in office – portended a surge in US military activity in Yemen for the year ahead (see the ‘AQAP, Daesh and counterterrorism operations’ section below for details). Also among Trump’s first acts after taking office was an executive order entitled “Protecting the Nation from Foreign Terrorist Entry into the United States” – the so-called Muslim ban – prohibiting people from seven Muslim-majority countries, Yemen among them, from entering the US. Trump’s burgeoning relationship with Saudi Arabia and the UAE has increasingly guided and framed his administration’s actions regarding Yemen. Packed with hardliners deeply anxious over the growth of Iran’s influence in the region, his cabinet was the first US administration to label the Houthis officially one of Iran’s “proxy terrorists groups.” A year that saw the Trump administration increasing portray the Houthis as an extension of Iranian power was capped, in December, with US Ambassador to the United Nations Nikki Haley staging a media event at a military base in Washington, D.C.. There she displayed reconstructed missiles which she claimed the Houthis had fired into Saudi Arabia. Haley said Iran had smuggled these, among other weapons on display, into Yemen and thus were evidence of how Tehran was “fanning the flames” of Middle East conflict. January 20: Donald J. Trump is sworn in as the 45th president of the United States. January 27: President Trump signs Executive Order 13769, banning nationals from seven Muslim-majority countries, including Yemen, from entering the US. January 29: Following approval by Trump, US Navy SEALs launch a commando raid in Yemen that results in the death of 25 civilians, 14 AQAP militants, and one US commando, as well as the loss of a $70 million US Navy aircraft. February 3: National Security Advisor Michael Flynn issues a statement on Iran through the White House press secretary’s office in which he describes the Houthis as one of Iran’s “proxy terrorist groups.” This marks the first time that a US administration has called the Houthis a “terrorist” group. March sees intense debate among members of the US Congress, current and former government officials, and US agency representatives over the implications of, and potential US military involvement in, a Hudaydah offensive. Those advocating for robust US military involvement – including mainly Republican senators, some White House officials, and Pentagon staff, among others – argue that capturing Hudaydah is necessary to protect US interests. A group of bipartisan senators opposed to US involvement pen a letter to the White House expressing concern that the US will be drawn into a military quagmire with no clear exit strategy. March 8: Media reports emerge that US Secretary of State Rex Tillerson has signed measures to begin selling precision-guided weapons to Saudi Arabia. This is a reversal of policy: the Obama administration had blocked sales of such weapons to Riyadh, following a 2016 Saudi airstrike on a funeral hall in Sana’a that killed more than 150 people. April 10: 55 US representatives send a letter to the White House requesting that Trump seek congressional approval for any possible US military escalation or involvement in Yemen. May 2: Members of Congress send a letter to Defense Secretary Jim Mattis calling for greater congressional oversight of US involvement in the Yemen conflict. May 20: Trump makes international headlines for signing an agreement to sell US$110 billion worth of US military equipment to Saudi Arabia, in addition to US$350 billion more over the next 10 years. Subsequent analysis of the arms deal, however, showed it consisted largely of pre-existing arrangements, as well as letters of interest or intent, with few new contracts. May 25: A bipartisan group of senators again begins a campaign to halt a small portion of the arms sales to Saudi Arabia that included precision-guided munitions, citing what they say is the Kingdom’s established pattern of targeting civilians in Yemen. On the same day, Representatives Ted Lieu and Ted Yoho, both members of the House Committee on Foreign Affairs, issue a letter to the committee chairman urging an oversight review of the Saudi arms sale. June 7: Six Democratic members of Congress introduce the “Yemen Security and Humanity Act,” developed to coordinate federal agencies and departments looking to assist the humanitarian effort. June 13: In the US Senate, a joint resolution to block the precision-guided weapons sale to Saudi Arabia is defeated in a 47-to-53 vote. July 14: Three amendments are added to the National Defense Authorization Act (NDAA) aiming to halt funding for the Saudi-led military coalition’s war in Yemen, while also requiring more transparency regarding the United State’s involvement. The clauses are ultimately removed or watered down. September 21: Media reports emerge that Trump is in the midst of expanding the authority of the US military and the Central Intelligence Agency to carry out drone strikes in a number of selected countries. These reports note that the Trump initiative involves further dismantling Obama-era safeguards regarding military operations outside of officially declared war zones. Yemen is expected to be among the countries most affected by the policy change. September 27: US Representatives Ro Khanna, Thomas Massie, Mark Pocan, and Walter Jones introduce HR 81 which, if passed, will require the president to terminate unauthorized military operations in Yemen. October 30: A bipartisan bill calling for the withdrawal of US support for the war in Yemen is introduced. However, by November 2, leaders from both parties water down the language to call on the US to support the Saudis in abiding by their “no-strike” list. November 7: US Ambassador to the UN Nikki Haley strongly advises the UN to take action against Iran for violating UNSC resolutions through its alleged activities in Yemen. November 10: Commander of the US Air Forces Central Command Southwest Asia Lieutenant General Jeffrey Harrigian says Iran is providing Houthi-Saleh forces with ballistic missile capabilities, claiming Iranian markings had been found on missiles launched into Saudi Arabia. November 13: The US House of Representatives passes a non-binding resolution stating that US military assistance for Saudi Arabia’s military efforts in Yemen have not been authorized by Congress, apart from that assistance authorized by the 2001 or 2003 Authorizations for Use of Military Force. December 5: Secretary of Defense Jim Mattis says that the humanitarian situation in Yemen must be prioritized, adding, however, that the US will not play a role in easing the humanitarian situation. December 6: Trump calls on Saudi Arabia to allow food, fuel, water, and medicine to enter Yemen. December 11: A bill is introduced in the US House of Representatives to sanction Iran for its support of Houthi rebels. December 14: In Washington D.C., Ambassador Haley displays what she claims are pieces of the Houthi missile fired at Saudi Arabia on November 4. December 21: At a press briefing, Deputy Assistant Secretary of State Tim Lenderking says that there is no military solution to the Yemen conflict, while suggesting that Houthis can be part of future political negotiations if they stop attacking Saudi Arabia. December 29: In a statement to reporters, US Defense Secretary Jim Mattis says the US will continue to train Saudi-led military coalition pilots to identify authorized targets properly and to minimize civilian casualties. Many EU member states have also increased their Yemen-related activities. Both publicly and behind the scenes, Paris has increased its engagements with Yemen, with French government officials close to President Emmanuel Macron telling the Sana’a Center that these moves reflect the president’s personal policy agenda. Visiting the region in April, German Chancellor Angela Merkel discussed with the leaders of Saudi Arabia and the UAE a more active German role in the peace process, while also calling for an end to coalition airstrikes in Yemen. Sweden and the Netherlands took increasingly activist stances, helping to pave the way for the UN Human Rights Commission’s call for an independent inquiry into human rights violations this year. Sweden and Switzerland also co-hosted with the UN the “High-Level Pledging Event for the Humanitarian Crisis in Yemen” in Geneva in April 2017, which raised US$1.1 billion for humanitarian assistance (see ‘Humanitarian Developments’ for details below). Despite being perceived as somewhat in retreat from the international stage following the Brexit vote, the UK – as has historically been the case – has continued its engagement with the Yemen file, notably through the so-called “Quintet” – composed of the US, UK, UAE, Saudi Arabia and Oman. In the Middle East, Saudi Arabia, United Arab Emirates, Bahrain, and Egypt abruptly severed diplomatic ties with Qatar in June and imposed travel and trade bans. Unsurprisingly, this affected Yemen, as Doha was simultaneously expelled from the Saudi-led military coalition. The Qatari government had previously played a small but significant role in the coalition, sending troops and hosting events such as donor conferences. The Yemeni government also cut diplomatic ties with Qatar. This sparked divided reactions from the Islah party, which has had close ties to Qatar. That said, Islah’s leadership officially distancing themselves from both Qatar and the “international Muslim Brotherhood” paved the way for a tentative reconciliation with key coalition members, including the UAE. Moscow also continued to exercise behind-the-scenes influence and diplomacy in 2017. For instance, in October the Saudi-led military coalition agreed to suspend its air blockade of the Sana’a airport to allow a flight carrying Russian surgeons to land, with these doctors coming to perform cataract surgery on Saleh. Much of this was facilitated through the continued Russian diplomatic presence in Sana’a, with Moscow being the only foreign power besides Tehran to maintain its embassy in the Yemeni capital throughout the conflict. Circumstances changed following Saleh’s death in December, however. According to Sana’a Center sources, members of Saleh’s GPC party fleeing the Houthis had sought refuge at the Russian embassy. The Houthis responded by threatening to storm the building. Moscow promptly closed its diplomatic mission in Sana’a and evacuated its staff. April 30: German Chancellor Angela Merkel visits Saudi Arabia and the UAE to discuss, among other things, increased German engagement in the Yemen peace process. While in Saudi Arabia she also calls for an end to coalition airstrikes in Yemen. June 5: Saudi Arabia, the UAE, Egypt, Bahrain, the Maldives and the Yemeni government sever diplomatic ties with Qatar and impose trade and travel bans, initiating the so-called ‘Gulf Crisis’. August 6: The EU sends an official delegation, headed by Ambassador Antonia Calvo-Puerto, to Sana’a to meet with key Houthi figures and former President Saleh. This is the highest-level foreign diplomatic visit to the Yemeni capital since the launch of Operation Decisive Storm. Plans for follow-up visits are put on hold in December following clashes in Sana’a and Saleh’s killing. September 11-15: The EU delegation to Yemen hosts informal consultations in Château Jemeppe, Belgium, with more than 30 tribal leaders from various areas across Yemen. While details of the discussions remained confidential, the general premise of the meeting is to explore potential new avenues for conflict resolution and track II negotiations. October 11: Russian doctors are flown to Sana’a to treat Saleh for cataracts. The arrival of the doctors entails a rare pause in the Saudi-led military coalition’s air blockade of northern Yemen. According to AFP, the US has facilitated their entry; US government officials apparently want Saleh to be “in good health” in order to facilitate negotiations with the Houthis. November 6: The Saudi-led military coalition imposes the immediate closure of all land, sea and air ports into Yemen. In mid-November, ports in southern Yemen under Yemeni government control are allowed to re-open. November 30: The European parliament passes a resolution calling for a political resolution to the Yemen conflict and an arms embargo on Saudi Arabia. December 12: Russia announces the closure of its embassy in Sanaa. December 13: In Riyadh, Saudi Crown Prince Mohammed bin Salman and UAE Crown Prince Sheikh Mohammed bin Zayed al-Nahyan meet the Chairman of Islah, Mohammed Abdullah al-Yidoumi, and Islah Secretary-General, Abdulwahab Ahmad al-Anisi. Other Saudi and UAE intelligence officials are also present. December 24: French president Macron calls Saudi King Salman to call for the coalition to lift the blockade on Yemen. In January 2017, then-UN Emergency Relief Coordinator Stephen O’Brien said Yemen had become the single largest food security emergency in the world and warned of the likelihood of famine in 2017. Shortly after, the UN and humanitarian partners launched the largest ever international humanitarian appeal for Yemen of US$2.1 billion. This amount was later increased to US$2.3 billion in response to the cholera epidemic. By mid-December 2017 the international community had provided 70.5 percent of the US$2.3 billion appeal. According to the FAO, 2017 ended with 17.8 million Yemenis being food insecure, an increase of 800,000 people since the first quarter of the year. (Importantly, in the spring of 2017, UN agencies updated their method for calculating populations experiencing food insecurity. This led to an apparent month-to-month decrease in the number of food insecure individuals; UN officials, however, pointed out this was a one-off circumstance that did not correlate to actual improved food security on the ground.) December 2017 saw 8.4 million Yemenis at risk of famine, a 24 percent increase relative to March. According to the OCHA Humanitarian Needs Overview 2018, there was a 15 percent increase in the number of Yemenis in acute need of humanitarian assistance to survive in the last five months of the 2017, with their number reaching 11.3 million people. At year’s end, 16 million Yemenis had difficulty accessing safe water and sanitation, while 16.4 million lacked access to proper healthcare. A cholera outbreak erupted in Yemen at the end of April 2017. This outbreak represented a second, much more virulent, wave of cholera following the first outbreak in October 2016. The first outbreak, though it had resulted in 24,000 suspected cases of cholera/acute watery diarrhea (AWD) over the intervening months, had been showing a steadily declining incidence prior to April 2017. Between the end of April and mid-May last year, however, the World Health Organization (WHO) recorded some 23,500 new suspected cases of cholera/AWD, with 242 associated deaths. As of 2 June, 2017, the UN Children’s Fund (UNICEF) was reporting almost 70,000 suspected cases of cholera/AWD and 600 deaths. A UNICEF official stated at the time that the number of cases in Yemen could rise to as much as 300,000 “within a few weeks’ time.” By December, the number of people estimated to have contracted cholera had surpassed 1 million, with more than 2,200 deaths. The cholera epidemic is the result of several factors. One is the breakdown of Yemen’s public health system due to the nonpayment of public sector salaries and a lack of operating funds. Another is the weakened immunities of those experiencing extended periods of malnutrition. Finally, public infrastructure is dysfunctional, with key water and sewage systems failing. Due to a lack of funds and high fuel prices, pumping stations have ceased operations; this in turn has forced many Yemenis to rely on unsanitary water sources, particularly locally drilled bore wells. As UN officials and humanitarian actors have repeatedly noted, the Saudi-led military coalition blockade of northern Yemen – which intensified substantially on November 6, 2017 – is a primary factor underlying the humanitarian crisis. The blockade has devastated the economy, causing mass loss of public services and livelihoods, price surges, and currency depreciation (see ‘Economic Developments’ for details below). All of these have undermined per capita purchasing power and the population’s ability to afford basic commodities such as food and medicine. At the same time, although the country’s health sector is devastated, Yemenis cannot seek medical assistance abroad. In particular, the coalition’s forced closure of Sana’a International Airport to commercial flights since August 9, 2016, has prevented thousands from seeking medical care outside the country, “killing more people than airstrikes,” according to an August 2017 Norwegian Refugee Council report. The ongoing conflict has also displaced more than three million people from their homes — approximately 11% of the total Yemeni population. Although roughly a third of those displaced have returned, two million Yemenis remain unable to return home. Prolonged exposure to armed conflict and violence has traumatized the population, leading to serious mental health concerns (for a more detailed overview of the long-term psychological effects of the conflict, see ‘The Impact of War on Mental Health in Yemen’, a joint report by the Sana’a Center for Strategic Studies, Columbia Law School Human Rights Clinic, and the Mailman School of Public Health). Compounding the humanitarian crisis, aid organizations attempting to respond to the crisis in 2017 faced obstacles, interference, and harassment to their operations by a range of parties to the conflict. Saudi-led military coalition forces repeatedly delayed ships carrying humanitarian cargo to Hudaydah port, even after being issued clearances by the UN Verification and Inspection Mechanism for Yemen. Beyond delaying humanitarian aid, the coalition’s air and naval blockade has also disrupted the commercial import food, fuel, and medical supplies. Coalition airstrikes in August 2015 also damaged cranes at Hudaydah port, forcing the port to operate at a reduced offloading capacity. In January 2017 the WFP attempted to deliver four new cranes – paid for by the US government – to Hudaydah to replace those damaged. The coalition, however, revoked the shipment’s entry permit, and the cranes were redirected to a storage facility in Dubai. In December the coalition announced it would allow the delivery of the cranes, and in mid-January 2018 the cranes were offloaded in Hudaydah. January 26: Then-UN Emergency Relief Coordinator Stephen O’Brien says the Yemeni conflict is driving the single largest food insecurity emergency in the world. In late January the Saudi-led military coalition revokes the entry permit for four WFP cranes destined for Hudaydah port. The new cranes are meant to restore offloading capacity that was lost following coalition airstrikes on the port in August 2015. February 21: A UN report states that since 2015 the conflict has displaced some 3 million Yemenis, but that some 1 million have since returned to their homes. “It’s testament to how catastrophic the situation in Yemen has become, that those displaced by the conflict are now returning home because life in the areas to which they had fled for safety is just as abysmal as in the areas from which they fled,” says the UN Refugee Agency Country Representative for Yemen, Ayman Gharaibeh. Among those displaced in early 2017 are 44,000 people who fled their homes because of the surge of fight in Taiz governorate. February 28: Then-UN Emergency Relief Coordinator Stephen O’Brien – after having secured guarantees of safe passage from all parties – has his convoy turned back from entering besieged areas of Taiz at a Houthi-Saleh checkpoint. April 12: The World Food Program announces that it is scaling up its emergency food operations in Yemen, attempting to reach 9 million people through 2017. April 25: With the $2.1 billion 2017 humanitarian appeal for Yemen less than 15 percent funded at the beginning of April, the governments of Sweden and Switzerland co-host with the UN a “High-Level Pledging Event for the Humanitarian Crisis in Yemen” in Geneva. The event raises $1.1 billion in pledges – covering more than half of the humanitarian appeal. End of April: A cholera epidemic breaks out and spreads across Yemen. Between the end of April and mid-May, the World Health Organization (WHO) records some 23,500 suspected new cases of cholera and acute watery diarrhea (AWD), with 242 associated deaths. May 23: The Health Cluster, led by the WHO, and the Water, Sanitation and Hygiene Cluster, led by UNICEF, appeals for US$66.7 million in funding to implement an Integrated Response Plan to the cholera outbreak. May 30: The Under-Secretary General for Humanitarian Affairs and Emergency Relief Cooperation Stephen O’Brien, in his statement before the UN Security Council, highlights that the collapse of basic public services – exacerbated by the incapacitation of the central bank in September 2016 – has directly contributed to the cholera epidemic. June 23: Saudi authorities announce that Crown Prince Mohammad bin Salman has pledged to cover the US$66.7 million funding appeal, made in May, to implement the Integrated Response Plan to the cholera outbreak. July 1: The WHO reports almost 250,000 suspected cases of cholera/AWD in Yemen, with some 5,000 new cases appearing daily and 1,500 deaths from the disease to date. Later in July, the epidemic in Yemen becomes the largest cholera outbreak ever recorded in one country in a single year. The previous largest outbreak over the course of a year had been the 340,oo0 cases recorded in Haiti in 2011; Yemen surpasses that in less than seven months. July 16: OCHA announces that the number of Yemenis in need of some form of humanitarian assistance has risen to 20.7 million, up from 18.8 million in January. Largely in response to the cholera outbreak, OCHA revises and increases its Yemen Humanitarian Response Plan for 2017 by 13 percent. The new UN appeal for Yemen calls for international donations worth US$2.3 billion. November 6: Saudi Arabia enforces a blockade on all land, sea, and air ports into and out of Yemen. November 13: Coalition reopens ports in Yemeni government controlled areas, while the blockade of Houthi-Saleh held areas in northern Yemen remains. November 25: Following the reopening of Sana’a airport to humanitarian flights, UNICEF-chartered planes deliver 1.9 million doses of vaccines for 600,000 children against several diseases, including diphtheria. December 20: UNICEF delivers approximately 6 million more doses of vaccines for various diseases to Sana’a International Airport. December 20: The Saudi-led military coalition announces it will reopen Hudaydah port to commercial imports of food and fuel for 30 days and allow for four new cranes to be installed to restore lost offloading capacity. December 24: Under Secretary-General for Humanitarian Affairs Mark Lowcock releases a statement on the alarming number of people on the edge of starvation in Yemen. He reiterates the urgency of allowing more commercial imports into the country after the coalition enforced a total blockade in early November. According to Lowcock, “8.4 million […] are already on the edge of starvation” and that “commercial food imports are needed to keep food available and affordable in markets across the country.” On the same day the first commercial fuel cargo since the blockade was eased is allowed to dock at Hudaydah port. OCHA releases its 2018 needs assessment report, putting the number of those in humanitarian need in Yemen at 22.3 million persons. December 31: By year’s end the UN Office for the Coordination of Humanitarian Affairs (OCHA) receives 70.5% of its appeal for USD $2.3 billion to implement its humanitarian response plan for Yemen in 2017. This is a US$690.6 million shortfall which carries over into 2018. According to Yemen’s Ministry of Planning and International Cooperation, Yemen’s gross domestic product contracted 14.4 percent in 2017. This, following an economic contraction of 15.3 percent in 2016 and 17.6 percent in 2015, amounts to a 40.5 percent loss in economic activity since the start of the conflict. In January 2017 the average market exchange rate for the Yemeni rial (YR) versus the US dollar was YR 321 to US$1, according to Central Bank of Yemen (CBY) figures. By December 2017 the average market price was YR 453 to US$1 – a change of 41 percent relative to the start of the year. As December ended, the rial was trading in the range of YR 460 to $1. For perspective, Yemen’s domestic currency was trading at YR 215 to US$1 at the start of the conflict, meaning that the number of rials it took to purchase a single US dollar increased 114 percent between March 2015 and the end of 2017. Currency stability was a critical issue for Yemen in 2017, given the country’s overwhelming dependence on imports to meet the population’s nutritional needs – prior to the conflict, the country imported 90 percent of its basic foodstuffs. Factors that continued to weigh on the rial in 2017 were the widespread collapse of economic activity and government services; widespread insecurity and worsening humanitarian conditions; the cessation of oil exports (previously the largest source of foreign currency and government revenue); and the decreasing ability of the Central Bank of Yemen (CBY) to intervene in the market, given its depleted foreign currency holdings. President Abdo Rabbu Mansour Hadi’s 2016 decision to move the CBY headquarters from Sana’a to Aden, and the CBY’s subsequent dysfunction, also continued to complicate the country’s fiscal and monetary management through 2017. Several factors mitigated the downward pressure on the rial: foreign remittances from Yemenis working abroad constituted the largest source of new foreign currency following the cessation of oil exports; international humanitarian aid funds continued throughout 2017; and regional parties to the conflict also contributed to currency inflows. These inflows, however, were not enough to halt the rial’s general decline in value through 2017. Yemen’s domestic currency also experienced periods of dramatic instability, one in early February and another that began in October and intensified through until the end of the year. (For details on the causes and ramifications of Yemen’s currency instability, see the Sana’a Center Economic Bulletins from March, September and October.) As documented by the Sana’a Center, authorities on both sides of the conflict have made significant efforts to combat currency instability and decline. However, these actions have been primarily stopgap measures and have been unable to address the fundamental issues causing the decline in currency. President Hadi claimed in early 2017 that Saudi authorities had promised to make a $2 billion deposit into the CBY in Aden to shore up its nearly exhausted foreign currency reserves. As 2017 ended, this deposit had yet to arrive; however, in early December a Sana’a Center financial source stated that the Saudi transfer was likely to take place in early 2018. Throughout 2017, many Yemeni public sector workers, particularly those in healthcare and education, suffered from the non- or partial payment of their wages (for details on the challenges facing the CBY and the non-payment of public sector wages, see the Sana’a Center report on Yemen Without a Functioning Central Bank). The inability to pay wages has been exacerbated by a continuing cash liquidity crisis and the decline of government revenues. The use of newly printed rials by the Yemeni government to pay public sector wages has been a source of controversy, largely due to fears that disbursing currency unsupported by increased economic activity or a replenishment in CBY’s foreign reserves would exacerbate inflationary pressures. When salaries were in fact paid in 2017, it was on an ad hoc, irregular basis. In areas nominally controlled by the internationally recognized Yemeni government, the payment of salaries was hampered by the security and administrative challenges facing the Aden CBY. In Taiz, for example, the Hadi government only ensured a delivery of salaries to the governorate after the governor resigned in protest. In northern Yemen – where the majority of the population and roughly 1 million of the country’s 1.2 million public sector workers are based – the Houthi-Saleh authorities continued to face a cash liquidity crisis. In the first half of the year, a commodity voucher system was deployed as an alternative payment measure. Inherently flawed and only ever partially implemented, the voucher system was largely discontinued months later (for more details on the voucher system, see the Sana’a Center April 2017 Review). Given that public sector workers were generally the breadwinners in their household, an estimated 7 million people continue to be impacted by the non-payment of public sector salaries in 2017, exacerbating the country’s food security crisis. Regarding private sector losses, commercial businesses have on average cut operating hours by half since the conflict began, with layoffs estimated at 55 percent of the workforce. This shift has been spurred by surging costs, due to insecurity and shortages of inputs, and falling demand for goods and services, with public purchasing power tumbling on the back of widespread livelihood loss and domestic currency depreciation. Some 1.5 million Yemenis registered with the country’s Social Welfare Fund (SWF) had been without support since the fund ceased operations in December 2014. Last year, however, the World Bank supplied UNICEF and the United Nations Development Program with $400 million to restart the SWF. The first $50 million distribution of cash occuring in August in partnership with the local al-Amal Microfinance Bank. The program is intended to initiate cash-for-work programs and reach 1.5 million beneficiaries in six Yemeni governorates. End of January: The market exchange rate for the rial is roughly YR 330 to US$1. The Yemeni rial falls as much as 20 percent in value against the US dollar in market trading before authorities in both Sana’a and Aden enact stabilization measures. Late February: Houthi-Saleh authorities impose a customs duty on all commercial trucks entering Houthi-Saleh controlled governorates, effectively doubling the customs duty already paid by traders at the ports. April 9: The Ministry of Trade in Sana’a initiates a program to pay 50 percent of public wages with vouchers, which workers can redeem at pre-approved marketplaces. July 6: The Aden CBY reactivates its connection to the SWIFT international financial transfer system. Following this, the US Treasury unfreezes Yemen’s foreign currency reserves, frozen since the transfer of the CBY headquarters from Sana’a to Aden in September 2016. End of July: Banking sources in Sana’a reported that the voucher system implemented in April 2017 by the Houthi-Saleh authorities has substantially ceased to operate. End of July: The CBY in Sana’a begins publishing monthly exchange rate data, in a move interpreted as an effort to pressure banks and currency traders to offer fairer rial-dollar exchange rates. August 12: The CBY in Aden issues a statement that the Saudi-led military coalition is impeding the delivery of urgently needed financial reserves to the government in Aden. The statement claims that the coalition has 13 times denied landing permits to aircraft carrying cash funds. August 14: The CBY in Aden issues a circular stating that it will float the value of the rial, with the official exchange rate to be set according to the market rate. August 20: Distribution of the first $50 million installment of a new $400 million UNICEF and UNDP program begins, restarting Yemen’s Social Welfare Fund (SWF) to aid some 1.5 million people in the poorest segments of society. October 4-6: A meeting took place in Berlin between the International Monetary Fund (IMF), UN, World Bank, representatives of the CBY, Yemeni businesses, and private Yemeni banks. According to Sana’a Center sources, CBY Governor Monasser al-Quaiti promised private banks that the CBY would pay interest on the current accounts and debt private sector companies hold at the CBY. Throughout October: The Yemeni rial loses 10 percent of its value relative to the US dollar, beginning the currency’s second period of rapid depreciation in 2017. November 20: The US Department of the Treasury announces that it has designated a major currency counterfeiting network involving individuals and entities associated with Iran’s Islamic Revolutionary Guard Corps-Quds Force. “This network employed deceptive measures to circumvent European export control restrictions and procured advanced equipment and materials to print counterfeit Yemeni banknotes potentially worth hundreds of millions of dollars,” states the Treasury. December 26: Houthi authorities instruct the Sana’a CBY to freeze and seize 1,223 bank accounts at public and private banks. Many of these accounts are held by Yemenis living abroad and are accused by Houthi authorities of loyalty to the Hadi government. The Aden CBY issues a circular the same day claiming that the Houthi measures are “illegal” and ordering Yemeni banks not to obey. December 31: The rial is trading in the range of YR 460 to US$1. Among the most significant events of 2017 in Yemen was the collapse of the Houthi-Saleh alliance and the killing of former President Ali Abdullah Saleh at the hands of the Houthi fighters in early December. Saleh was the most prominent Yemeni political figure of the last four decades, and his death is widely seen to have made it far more difficult to achieve a negotiated settlement to the conflict. The General People’s Congress (GPC) party – which Saleh had founded and headed – also began to fracture in his absence. Tensions within the Houthi-Saleh alliance had existed throughout the conflict. However, these tensions increased throughout 2017 as internal competition emerged over government positions and as the Houthi leadership challenged Saleh’s entrenched patronage networks for access to public revenues. As 2017 progressed, the Houthi leadership also became more suspicious of Saleh’s intentions, not least due to the former president’s repeated calls for dialogue with Saudi Arabia. These tensions were apparent in August, when Saleh’s GPC staged a large rally in Sana’a to mark the party’s 35th anniversary and to demonstrate his popular support. Later in the month, armed clashes broke out between fighters on both sides and resulted in three deaths. Tensions and competitive grandstanding continued through September, notably over ministerial portfolios. The Houthis held demonstrations to celebrate the anniversary of their September 2014 takeover of the capital. On October 19 Houthi and GPC leaders again traded public allegations, with the GPC accusing the Houthis of conducting an “orchestrated campaign” against Saleh, and the Houthis claiming that the GPC was accepting money from the Hadi government. These tensions escalated significantly in late November, and by the beginning of December had burst into widespread battles in the streets of Sana’a. On December 2, Saleh made a televised speech calling on Yemenis to rise up against the Houthis, as well as declaring his readiness to turn a “new page” with the Saudi-led military coalition. Saleh-allied forces initially appeared to gain the upper hand, though were quickly routed by Houthi fighters. On December 4 Houthi fighters posted a video online of the former president’s bullet-ridden body being hoisted into the back of a pickup truck. (For more on the implications of Saleh’s death, see recent analysis by the Sana’a Center on Yemen After Saleh). The Saudi-led military coalition subsequently began heavy bombardment of Sana’a, with the International Committee of the Red Cross reporting on December 5 that more than 230 people had been killed and 400 wounded in the capital during the violence. While the Houthis have since consolidated political and military control over the areas of northern Yemen that they had previously co-managed with the GPC, a number of key Saleh loyalists – most notably, military leader Fadl al-Qawsi – have broken with the Houthis and fled to Marib and other areas under the control of coalition forces. Throughout February disputes within the Houthi-Saleh alliance continue to prevent the appointment of a successor to Ali al-Jaifi, the head of the Republican Guard who was killed in Saudi-led military coalition airstrikes on a funeral gathering in Sana’a in October 2016. Through February a local dispute in Ibb governorate stokes wider tensions between the Houthis and Saleh. The dispute centers on Houthi affiliates issuing their own local building permits, which are a significant revenue generator, and undermining the authority of ministry officials in Sana’a loyal to Saleh. May 9: Saleh reiterates his desire to enter into dialogue with Saudi Arabia during a GPC party meeting, stating that: “We are ready to go to Riyadh, Khamis Mushait [in southwest Saudi Arabia, near the border with Yemen], Muscat or elsewhere to start dialogue and to reach an understanding.” Separate reports claim that GPC and Saudi officials had been meeting for weeks in Berlin prior to Saleh’s public call for dialogue. August 24: Saleh’s GPC marks its 35th anniversary with a massive rally in Sana’a amid increasing tensions with the Houthis. On the same day, the Houthis hold a series of their own separate, smaller demonstrations in Sana’a. Houthi leadership tightens security across the capital, partly due to fears that Saleh is using the rally as a smokescreen while his supporters from outside the capital enter Sana’a ahead of a possible mutiny. August 26: Key Saleh-allied colonel and GPC official Khaled al-Radhi is killed amid fighting with the Houthis in Sana’a, fueling days of tension and intermittent clashes prior to a reconciliation agreement. September 21: The Houthis hold a large rally in Sana’a to mark three years since their takeover of the capital. The rally is a show of force to domestic onlookers, including Saleh and his supporters, as well as to regional and international actors. September 30: Media reports describe Houthi militants storming the Ministry of Health in Sana’a and removing at gunpoint the GPC-allied Minister of Health Mohammed Salem bin Hafez. October 7: Houthi forces bar GPC-allied Foreign Minister Hisham Sharaf Abdullah and his staff from the Foreign Ministry, acting under what they claim are direct orders from the President of the Supreme Political Council, Saleh al-Samad. October 19: Houthi and GPC leaders trade public allegations: the GPC accuses the Houthis of conducting an “orchestrated campaign” against Saleh, while the Houthis claim that the GPC is accepting money from the Hadi government. November 28: Saleh gives a speech in which he says that if the Saudi-led military coalition lifts the blockade and stops its bombing campaign, “decision makers” will stop firing missiles into Saudi Arabia. On November 29, clashes break out between Houthi and Saleh forces at the Saleh Mosque in Sana’a. The clashes stem from Houthi demands for access and space to celebrate the birthday of the Prophet Muhammad. The initial clashes result in the death of four Saleh loyalists. Over the next several days further clashes follow, along with heated exchanges of rhetoric, while Houthi leader Abdulmalik al-Houthi publicly warns Saleh against undermining the alliance. December 2: Following failed de-escalation attempts, violence between Houthi and Saleh forces breaks out across the capital. On the same day, Saleh makes a televised speech. In it he calls on Yemenis to rise up against the Houthis, whom he refers to as a “coup militia,” and declares his readiness to turn a “new page” with the Saudi-led military coalition. In response, the internationally recognized Yemeni government and Saudi Arabia acknowledge Saleh’s decision to break his alliance with the Houthis. December 2-4: After Saleh forces initially gain the upper hand in the battle for Sana’a, Houthi reinforcements from Sa’ada and Amran governorates arrive to support a decisive Houthi counteroffensive. Houthi forces successfully overturn the initial gains made by Saleh forces and assail the homes of the former president and his family. Yemen has witnessed increasing socio-political fragmentation since the beginning of the conflict – a trend that continued through 2017. Among the most prominent fault lines that emerged were those between various groups and armed factions affiliated with the internationally recognized Yemeni government and local forces and political figures backed by the UAE. This became apparent in February when a dispute over unpaid wages for soldiers guarding the Aden airport spilled into armed clashes between the Presidential Guard, headed by Hadi’s son Nasser, and two armed groups affiliated with the UAE. The violence climaxed with an Emirati helicopter gunship opening fire on a Presidential Guard vehicle, killing multiple soldiers. Shortly after, Hadi and Emirati officials met in Riyadh to try and smooth tensions. April saw more clashes between the UAE-backed Hezam al-Amni, or “Security Belt” forces – at the time headed by the prominent UAE-allied Salafi leader Hani bin Brayk – and Presidential Guard units. At the beginning of the month the two fought for control over the strategic Al-Alam checkpoint in eastern Aden. At the end of April, UAE-allied forces controlling the airport and the Presidential Guard were then involved in another armed standoff, again erupting into clashes in May. Similar violent incidents and insecurity remained constant features of life in Aden through the rest of 2017, accompanied by sporadic and spectacularly violent terrorist attacks (see ‘AQAP, Daesh and Counterterrorism Operations’ for details below). At the end of April, Hadi sacked UAE-allied Aiderous al-Zubaidi from his position as governor of Aden and Hani bin Brayk, who aside from heading the Security Belt forces was also a minister of state. These events sparked escalating public protests that culminated in al-Zubaidi announcing the formation of the Southern Transitional Council (STC) on May 11. Supported by the Southern Movement coalition, the STC was to be made up of 26 southern Yemeni political, military and tribal leaders. Later in May, thousands of supporters of the STC gathered in Aden’s Khormaksar district calling for an independent South Yemen. Tensions were heightened on June 28, when President Hadi issued a decree sacking the governors of Hadramawt, Socotra and Shabwa. All three governors were members of the STC, and Hadi justified the move as retaliation for their support for the secessionist movement. By the end of 2017, Hadi’s efforts to purge officials sympathetic to the STC had resulted in him sacking the governors of Lahj, al-Dhale, Soqotra, Hadramawt, Aden, Abyan and Shabwa. In October, the STC staged demonstrations in Aden during which al-Zubaidi, now president of the STC, announced the establishment of a 303-seat “Southern National Assembly” (SNA) and an upcoming independence referendum to be held on an unspecified date. By late 2017, the STC had named the 303 members of its new governing body and appointed local STC leaders for each southern Yemeni governorate. In addition to general insecurity in Aden, Southern Movement organizers have also capitalized on popular dissatisfaction with the Hadi government related to Aden’s failing public services. On October 30, for example, protesters blocked roads in the southern coastal city with burning tires. They expressed anger at the constant power outages and fuel and water shortages, which had left hospitals in the city warning they could be forced to shut down due to lack of electricity. On November 16, Abdulaziz al-Muflihi, the new governor of Aden, resigned after months of complaining that he was being inhibited from carrying out the functions of his office. During the final months of the year the rivalry between the Islah party – a major supporter of President Hadi – and the Southern Movement then escalated, with attacks and assassinations targeting members of both sides. In late December, bin Brayk, now STC vice-president, publicly blamed Islah for the lack of successful military advances towards Sana’a. Hadramawt witnessed its own momentum for increasing autonomy during 2017. In April, the Hadramawt Inclusive Conference was staged in Mukalla city, where stakeholders and power brokers exclusively from Hadramawt emphasized the centrality of their Hadrami identity over their Yemeni one. At the conference, participants made public statements regarding the need for the governorate to assert control over its security institutions, governance, and natural resources such as oil and gas. Various speakers referred to “50 years of oppression” – covering the period both after Hadramawt had joined South Yemen (1967), and after the unification of North and South Yemen (1990). This implied a rejection not only of central government rule from Sana’a and President Hadi’s project for a unified Yemen, but also of the Southern Movement’s goal to establish a unified, independent South Yemen including Hadramawt. The UAE has played patron to Hadrami ambitions for greater independence, helping to create, train, and arm the Hadrami Elite Forces. These have acted with increasing autonomy from the Hadi government, asserting their lead in operations against AQAP and demanding that government troops hand over control of various checkpoints across Hadramawt. Similar UAE-backed security forces have been set up in Shabwa, and, more recently, Mahra. The increasing desire for autonomy in Hadramawt was seen by observers as being a central reason why the governorate was given a disproportionately large number of seats in the SNA (for more on the SNA, see the Sana’a Center’s November edition of Yemen at the UN). February 10: Fighting breaks out at Aden airport between forces loyal to President Hadi and UAE-backed Security Belt forces (for details, see the Sana’a Center’s February edition of Yemen at the UN). April 4: Aden governor Aiderous al-Zubaidi issues the “Aden Historic Declaration.” In it, he calls for the formation of a national political leadership under his stewardship to manage an independent South Yemen. April 23: The Hadramawt Inclusive Conference is held in Mukalla. While attracting a wide spectrum of Hadrami leaders and garnering significant support and attention, the event does not result in any immediate, tangible policy shift. April 29: After clashes in Aden between pro-Hadi forces and pro-UAE forces led by Aiderous al-Zubaidi, Hadi formally sacks al-Zubaidi. This leads to widespread popular protests. May 11: The Southern Transitional Council (STC) is officially formed under the leadership of al-Zubaidi. An umbrella group for secessionists, the STC quickly garners widespread popular support in much of the south while fueling resentment and distrust within the internationally recognized government. The STC’s formation is rejected by the internationally recognized government, and in late June Hadi fires a number of officials who have joined the body, as well as the governors of Hadramawt, Socotra, and Shabwa. May 29: Clashes erupt at the Aden airport between the Presidential Guard units and UAE-backed forces. October 14: At STC-organized demonstrations in Aden, al-Zubaidi announces the formation of a 303-member “Southern National Assembly.” This comes amid a flurry of activity that sees STC members inaugurate local offices in key cities across the south. In the first week of November, the Sana’a Center organizes a press delegation to Marib governorate that brings almost 20 journalists from Western media outlets together with leading politicians, tribal leaders, and civil society. This is the first delegation of foreign journalists to visit Yemen since the beginning of the current conflict, and is the largest foreign delegation to visit Marib since 2007. November 17: Aden governor Abdulaziz al-Muflihi resigns in protest, claiming he is unable to perform his duties and accusing Prime Minister Ahmed Obeid bin Daghir’s government of corruption. December 24: Hadi sacks the last remaining STC members holding ministerial or gubernatorial positions in his government. From July 2015, when the Saudi-led military coalition backed southern Yemeni forces in pushing Houthi-Saleh fighters from Aden, until early 2017, the conflict’s frontlines remained largely static in Yemen. Then, in January 2017, the coalition and allied Yemeni ground units launched “Operation Golden Spear.” The first phase of this was aimed to clear Houthi-Saleh fighters from the western coastline of Taiz, to secure the strategic Bab al-Mandab Strait, and to reclaim Mokha port. These stated objectives were achieved by the end of the month. However, the second phase of the operation – whose stated objectives included the retaking of Hudaydah port – quickly stalled. On the ground, Houthi-Saleh units’ mass deployment of landmines and stiff resistance kept coalition backed-forces from advancing along the coast north of Mokha for most of the year. In early 2017 this spurred Saudi Arabia, the UAE, and their supporters in Washington, D.C., to call for the US to increase military support for the Hudaydah offensive. The Saudi-led military coalition had long claimed that Iranian weapons were being smuggled to Houthi forces through Hudaydah port – a claim widely disputed by UN agencies. Importantly, the administration of former US President Obama had rejected a 2016 request from the UAE for military aid to attack Hudaydah. The Obama administration had concluded that even with US support the assault was unlikely to succeed, given how well-entrenched and well-armed Houthi-Saleh forces were in the area. Obama’s advisors had also noted that the assault would dramatically exacerbate Yemen’s humanitarian crisis; the country had imported up to 90 percent of its food supplies prior to the conflict, with Hudaydah port since accounting for an estimated 70-80 percent of humanitarian deliveries and an even greater share of commercial imports. However, the belligerent rhetoric of the subsequent US administration toward Iran was widely seen to embolden Saudi-led military coalition attempts to solicit direct US military aid for a potential Hudaydah offensive. On March 17, following a Russian request, UNSC member states discussed the expected Hudaydah attack. During the discussion many member states expressed concern that the attack would exacerbate the humanitarian crisis, though none went so far as to say that the assault should not take place. Following the briefing, UNSC member states released an “elements to the press” ‒ the weakest form of Security Council public statements ‒ calling for access for humanitarian and commercial goods in Yemen, including through Hudaydah. Throughout April, the proposed assault and its likely humanitarian fallout dominated international policy discussions regarding Yemen. However, by month’s end, opposition within the US, at the UN, within the humanitarian community and elsewhere appeared to gain purchase. Among hawkish US policy makers and the Saudi-led military coalition, the rush to attack lost momentum. Operation Golden Spear thus made almost no headway through 2017 until the death of former President Saleh in early December. Just days after Saleh’s death, UAE-backed local forces, supported by Sudanese troops, advanced north of Mokha and forced the Houthis to withdraw from Khokha district on December 7. Although the stated objective of the second phase of Operation Golden Spear remains the capture of Hudaydah and its port, as 2017 ended it was unclear whether the coalition planned a more concerted attempt to achieve this objective. Among the most notable political developments with military implications following Saleh’s death was the public reconciliation between the Yemeni Islah party and the UAE. From the Saudi-led military coalition’s initial intervention in March 2015 until Saleh’s death, the UAE had been reluctant to coordinate with Islah-affiliated politicians and militias – such as those operating in the Taiz, Marib and al-Jawf governorates, among other areas – due to Islah’s links to the Muslim Brotherhood. Also following Saleh’s death, Houthi forces in Shabwa governorate lost control of Bayhan and Asailan districts. These two strategic areas, held by the Houthis throughout the conflict, provided a base from which to threaten the supply lines of Yemeni government troops and UAE-backed local forces. Barring a few pockets of resistance, Houthi forces were subsequently pushed out of the governorate altogether. In December, anti-Houthi forces also made new advances and territorial gains in al-Bayda and al-Jawf governorates. Houthi territorial losses at the end of 2017 were significant in that they constituted the first major frontline movements in many months. However, in the overall military dynamics of the Yemen war, their strategic value is relatively minor. A decisive military victory by any side in the conflict appears no more likely at the beginning of 2018 than it did a year earlier. Sudanese troops represented a major, underreported component of Saudi-led military coalition efforts on the western coastline in 2017, with thousands of Sudanese troops participating in Operation Golden Spear. An April brief by the Small Arms Survey suggested that several thousand Sudanese troops in Yemen are from Sudan’s “Rapid Support Forces” (RSF). The RSF are officially sanctioned paramilitary units that were largely formed from the Janjaweed militias – infamous for their genocide campaign against tribes in Sudan’s western Darfur region in the 2000s. Sudanese losses have been significant, with reports of over 400 Sudanese soldiers being killed in Yemen by mid-2017. January 7: Coalition-backed forces mobilize in southwestern Taiz and Lahj governorates for the launch of “Operation Golden Spear.” The bulk of the fighters participating in the offensive are southern fighters redeployed from Aden and Lahj governorates. January 23: After regaining control of Dhabab district in western Taiz that overlooks the strategic Bab al-Mandab Strait, anti-Houthi forces gain control of Mokha port and the town center. Following intense clashes that began in late January, through early February anti-Houthi forces clear the town of Mokha of remaining pockets of Houthi-Saleh resistance. Houthi allied fighters withdraw towards the town of Khokha, north of Mokha, and to areas around the Khalid Bin Al-Walid military base to the east. The coalition-backed offensive stalls, however, as Houthi-Saleh forces deploy landmines and mount stiff resistance to halt coalition units from advancing north of the city. February 22: A Houthi-Saleh ballistic missile strikes an anti-Houthi military camp in Mokha city. The attack results in the death of the Deputy Chief of Staff of the Yemeni Army, Ahmed Saif al-Yafai, and several others. Saudi Arabia, the UAE and their supporters in Washington, D.C., advocated for increased US military support for the second phase of Operation Golden Spear – the stated objective of which is to capture the Houthi-controlled Red Sea port of Hudaydah. The operation’s opponents include US legislators, UN officials, and humanitarian agencies; they highlighted the likely catastrophic humanitarian impacts of such an attack. Throughout April, international policy discussions on Yemen again focus on the Saudi-led military coalition’s proposed assault on Hudaydah port. By the end of April, however, the coalition and US policymakers advocating in favour of increased US military support for the offensive appear to bow to widespread international opposition to the offensive. May 10: Houthi forces attempt to seize control of Saudi watchtowers in the Najran province of Saudi Arabia north of the Houthi stronghold of Sa’ada governorate. The operation is part of the two-pronged Houthi strategy against Saudi Arabia, consisting of cross-border raids and missile launches into Saudi territory. May 19: The Houthis fire a missile at an area west of the Saudi capital of Riyadh shortly before US President Trump is due to arrive to the Kingdom. Saudi media claim the missile safely intercepted by Saudi air defence systems. The missile attack aids Saudi Arabia as it casts the Houthis as an Iranian proxy, a narrative also subsequently adopted by the Trump administration. Taiz witnesses a sharp uptick in military activity as anti-Houthi forces make a series of territorial gains inside Taiz city, capturing Taiz University Medical College and the Central Bank of Yemen (CBY) office. At the end of the month, anti-Houthi forces increase their efforts to wrest control of Taiz’ Presidential Palace and its environs from Houthi-Saleh forces. July 26: Anti-Houthi forces capture the Khalid bin al-Walid military base after months of fighting in areas surrounding the base. Khalid bin al-Walid is one of the largest military bases in Yemen and is situated near the Mafraq junction linking Mokha, Hudaydah and Taiz city. Its capture marks the most significant military breakthrough for anti-Houthi forces since taking full control of Mokha in February 2017. The capture of the base enables anti-Houthi forces to consolidate their control of western Taiz and the governorate’s southwestern coastline, as well as to threaten Houthi-Saleh supply lines and Houthi-Saleh forces located further north in Hudaydah governorate. November 4: The Houthis fire a ballistic missile at King Khalid International Airport in Riyadh. The Houthi-controlled defence ministry claims the missile attack is in retaliation for a Saudi-led military coalition airstrike on a market and hotel in the Sahar district of Sa’ada, resulting in at least 31 civilian casualties, including six children. Saudi Arabia claims that its air defence systems intercepted the missile, though independent investigations suggest otherwise. December 7: UAE-backed local forces, supported by Sudanese troops, capture the Khokha district, which is located on the southwestern edge of Hudaydah governorate. December 15: Anti-Houthi forces drive Houthi forces out of the Bayhan district of Shabwa governorate. Bayhan is located on a key road connecting the governorates of Shabwa and Marib. On the same day, anti-Houthi forces also drive Houthi forces out of eight anti-Houthi areas of Asailan district. December 26: After participating in the Bayhan offensive, members of the 107th Brigade affiliated with the internationally recognized Yemeni government launch a new offensive in the Nati’ district of al-Bayda governorate. End of December: Anti-Houthi forces advance in the Khab al-Sha’af district of al-Jawf governorate. At the beginning of January 2018, they take control of a key road that connects al-Jawf to Sa’ada governorate. In 2017, the United States under President Trump pursued a more aggressive campaign against al-Qaeda in the Arabian Peninsula (AQAP) than it had under former President Obama. Shortly after President Trump assumed the presidency, US Special Forces conducted an unprecedented raid in al-Bayda. Further Special Forces ground operations were carried out throughout the year, such as those in Marib in May and in Shabwa three months later. These raids demonstrated that US Special Forces were operating in close coordination with their UAE counterparts. The US also sharply increased the rate of its drone and airstrikes in Yemen throughout 2017. For perspective: the previous record of US-led aerial strikes, set in 2012, was 41 in a single calendar year. In 2017, the US surpassed this record in a single week in March as it conducted over 40 manned and unmanned aerial strikes in Abyan, al-Bayda, and Shabwa. In December, the United States Central Command (CENTCOM) stated that in 2017 the United States had carried out upward of 120 aerial strikes in Yemen against suspected militants from AQAP and Daesh (also known as the so-called ‘Islamic State’). Importantly, the US military has an established track record of underreporting its counterterrorism activities; according to a report published by the Sana’a Center for Strategic Studies and the Columbia Law School Human Rights Clinic the US has disclosed details of only 20 percent of its lethal force operations in Yemen, Somalia, and Pakistan since 2002. The report notes that, as of June, the US had carried out at least 90 airstrikes in Yemen in 2017 using drones, aircraft and missiles. These strikes had led to at least 81 deaths, including 30 civilians. In addition to the use of force, the United States sought to counter the threat of terrorism in Yemen through the exercise of soft power via the US Department of State and the US Department of the Treasury, which targeted various individuals and organizations in Yemen affiliated with AQAP and Daesh. For its part, the UAE expanded its established anti-AQAP model in Yemen, which aims to counter the threat of AQAP through the build-up and deployment of local, UAE-backed forces in Yemen’s southern and eastern governorates. Among the main strategic objectives of this model is to clear and subsequently hold areas where AQAP is known to be active. In February 2017, the Shabwa Elite Forces were officially established after being trained by the UAE in Hadhramaut. The Shabwa Elite Forces were then subsequently deployed across the governorate – adding to the presence of the already-established UAE-backed Security Belt forces in Aden, Abyan, and Lahij, as well as the Hadrami Elite Forces that had all been formed in 2016. In mid-2017, the Shabwa Elite Forces engaged in a UAE- and US-backed attempt to clear strategic areas associated with the governorate’s oil and gas infrastructure. In parallel to the anti-AQAP operation in Shabwa, Security Belt forces in Abyan sought to gain control of key roads, including the main road that connects Abyan to al-Bayda, the coastal road that runs from Zinjibar through Shabwa to al-Mukalla in Hadramawt, and the road passing through the Lawder district of Abyan. Despite suffering setbacks due to the counterterrorism efforts of the US and the UAE, AQAP remains an active threat. It is able to carry out attacks, recruit new membership, and deploy significant financial and military resources. Throughout 2017, AQAP continued its campaign of asymmetric warfare on several fronts, targeting UAE-backed forces in the southern and eastern governorates, while combatting Houthi-Saleh forces in the central al-Bayda and Ibb governorates where the Yemen affiliate of Daesh is also present. It is worth noting that AQAP’s forced withdrawal from areas in Shabwa and Abyan in mid-2017 is not necessarily a sign of weakness. AQAP’s withdrawal can partly be explained by its grand strategy of avoiding direct confrontation with superior forces in order to preserve its membership and capabilities. As illustrated by three significant terrorist attacks that occured in Aden in November, while comparatively smaller than AQAP, the Yemen affiliate of Daesh remained an active, arguably rising threat in 2017. Daesh in Yemen was most influential and active in al-Bayda governorate, where actions last year included a June 18 attack in which the group claimed to have killed 15 Houthi-Saleh fighters. The US military also claimed its first operations against Daesh in Yemen last year. The Pentagon said unmanned drones killed “dozens” of Daesh militants with missiles barrages on two training camps on October 16 and 25. January 29: Just nine days after Donald Trump is sworn in as US President, US Navy SEAL commandos conduct an unprecedented raid on a suspected AQAP compound in the village of Yakla, located in al-Bayda governorate. Although the US has previously conducted raids in Yemen in an attempt to free Western hostages, this is the first known instance of US Special Forces targeting a suspected AQAP compound. The raid results in an estimated 25 civilian casualties, including 9 children under the age of 13, in addition to the deaths of 14 AQAP members and one Special Forces commando. The raid also leaves four SEALs injured and results in the destruction of a $70 million US Navy aircraft. Throughout February, AQAP carries out a series of attacks against Houthi-Saleh forces, UAE-backed forces, and Southern Movement leaders, as well as other local military and security officials. AQAP fighters capture three towns in northern Abyan and briefly occupy several neighbourhoods in the city of Lowder. They assassinate two Houthi-Saleh commanders in Ibb governorate and then clash with Houthi-Saleh forces in the governorate’s al-Sayyani and Udayn districts. May 23: US Navy SEALs conduct a raid in the al-Jubah district of Marib governorate. After the raid, the Pentagon claims that AQAP used the targeted buildings as a headquarters from which to plan external operations. While the Pentagon claimed that the raid resulted in the death of seven AQAP militants and no civilian casualties, contrasting media and human rights groups investigations reported at least five civilians casualties, including a child. June 21: The US Department of State amends AQAP’s terror group categorization to include what it claims are AQAP front groups in Yemen, including ‘Sons of Abyan’, ‘Sons of Hadramawt’, ‘Sons of Hadramawt Council’, the ‘Civil Council of Hadramawt’ and the ‘National Hadramawt Council’. July 29: AQAP claims responsibility for the assassination of a prominent UAE-backed Security Belt forces commander, Colonel Nasir Saleh al-Ja’ari, in Abyan. Al-Ja’ari played an important role in retaking Abyan from AQAP militants in 2012. August 4: US Special Forces, UAE armed forces and UAE-backed Hadrami Elite Forces launch a joint operation to clear Shabwa of AQAP militants and to secure the energy resources and facilities located in the governorate. This includes the liquified natural gas (LNG) export facility in the coastal town of Belhaf. With the support of Saudi-led military coalition fighter jets, UAE-backed Security Belt forces continue the anti-AQAP campaign begun in August and aimed at securing parts of Abyan governorate. Throughout September, Security Belt forces conduct raids on AQAP safehouses in Abyan and reportedly kill two mid-level operatives in the districts of Mudiyah and al-Wadea. In retaliation, AQAP target a Security Belt forces checkpoint in Abyan. October 25: US Department of the Treasury sanctions eight individuals and one entity affiliated with AQAP and Daesh. November 5: Daesh militants target the criminal investigation department building in Aden’s Khormaksar district. The coordinated assault involves the detonation of explosives-laden vehicles and fighters storming the building. Daesh claims that the attack results in the deaths of more than 50 security personnel, while government sources report only 15 casualties. November 14: A Daesh-affiliated suicide bomber targets a UAE-backed Security Belt forces building located in Aden’s al-Mansoura district, killing at least six and injuring dozens. November 29: Daesh militants detonate a vehicle-borne explosive outside the Ministry of Finance building in Aden’s Khormaksar district. The attack kills four and heavily damages the building. Daesh also claims responsibility for several assassinations in November, including those of a crime investigator and counterterrorism unit member in Aden. In January 2017 a UN Panel of Experts report found that, up to that point in the conflict, all the belligerent parties had carried out “widespread violations” of international humanitarian law and international human rights law. This established pattern continued throughout the rest of 2017. The warring parties – including Houthi-Saleh forces, Yemeni government troops, the Saudi-led military coalition and affiliated local forces, as well as various non-state actors – regularly attacked civilians and civilian objects, launched indiscriminate attacks, carried out arbitrary detainments and torture, used banned weapons, impeded humanitarian aid and access, starved civilian populations, and carried out forced displacements, among other violations of international humanitarian and human rights law. Houthi-Saleh forces, Yemeni government troops, coalition-backed militias and AQAP have all been named in the report in two years in a row, and it should be noted that Saudi Arabia had initially been named in the 2016 report as well. Riyadh was, however, controversially removed from the 2016 report by then-Secretary-General Ban Ki-moon, after threatening to withdraw hundreds of millions of dollars in funding for UN aid programs. Saudi Arabia’s response to being named in the 2017 report was significantly more moderate. This is likely due to considerable consultation between it and the UN in the lead-up to the announcement. There is also a noticeable difference in the nature of the report. Instead of listing Saudi Arabia as a standard offender, the report listed the kingdom in a new category specifically for violators who have taken actions to address the problems documented in the report. Throughout the conflict, the UN High Commissioner for Human Rights has repeatedly called for the creation of an international, independent body to investigate allegations of violations of international humanitarian and human rights law by all sides in the Yemen war. For the third year in a row, this proposal was blocked at the UN Human Rights Council, notably by Saudi Arabia, the US and the UK. However, in late September the UN Human Rights Council approved a resolution to establish a group of three experts to investigate human rights violations by all the belligerent parties. Importantly, the mission scope and capacity of the group of experts – who were appointed in December – is less than that of a commission of inquiry. Notably, at year’s end media reports emerged that the UN High Commissioner for Human Rights Zeid Ra’ad al-Hussein would step down in the summer of 2018. In an internal memo to staff explaining his decision, al-Hussein said: “I have decided not to seek a second four-year term. To do so, in the current geopolitical context, might involve bending a knee in supplication; muting a statement of advocacy; lessening the independence and integrity of my voice.” In the letter al-Hussein questioned the UN’s credibility as a champion of human rights when its top official, Secretary-General António Guterres, is reluctant to speak out against human rights abuses by powerful governments. January 27: The UN 2140 Sanctions Committee Panel of Experts meets to discuss the panel’s report, which states that the conflict has seen widespread violations of international humanitarian and human rights law by all parties to the conflict. January 31: A US Navy SEAL counterterrorism operation on the village of Yakla, al-Bayda governorate, kills at least 25 civilians, nine of them children (see ‘AQAP, Daesh and Counterterrorism Operations’ for details above). February 10: The UN Office of the High Commissioner for Human Rights (OHCHR) issues a statement on “extremely worrying reports” of civilians being targeted during the battle for Mokha port. OHCHR states that “credible reports indicate that Houthi-affiliated snipers shot at families attempting to flee their homes in Houthi-controlled areas – suggesting the use of civilians as human shields.” OHCHR also notes that more than 200 private homes were either damaged or destroyed in coalition airstrikes. March 16: A Saudi-led military coalition Apache gunship strafes a boat carrying Somali refugees off the coast of Hudaydah, killing 43 people. Following the incident the UAE issues a statement saying its forces did not target the Somali vessel, having “clearly recognised the non-military nature of the boat which was carrying a large number of civilians.” The UAE calls for an independent international investigation into the incident – an unprecedented move which observers say is an attempt to ensure that Riyadh bears responsibility. Speaking about the incident and other attacks against civilians later in the month, Human Rights Watch (HRW) warns that continued US arms sales to Saudi Arabia risk exposing American individuals involved in these transactions to criminal liability for aiding and abetting war crimes. March 24: OHCHR says Houthi-Saleh forces have been enforcing suffocating sieges on areas in Taiz governorate, denying civilians access to basic necessities, restricting humanitarian access, and indiscriminately shelling civilian areas. April 20: HRW issues a report highlighting the Houthi-Saleh forces’ use of banned antipersonnel landmines, which the HRW says has caused hundreds of civilian deaths and injuries, hindered the return of people displaced by fighting, and will continue to pose a threat to civilians long after the conflict ends. Numbers provided in the report indicate that Houthi-Saleh forces have deployed tens of thousands, if not hundreds of thousands of landmines. May 26: HRW releases a report detailing how Houthi-Saleh forces, pro-government troops and UAE-backed security forces regularly carry out arbitrary detentions, forced disappearances, and torture and mistreat prisoners. These human rights abuses have targeted journalists, activists, political opponents, members of the general population, and children. June 13: The Sana’a Center and the Columbia Law School Human Rights Clinic publish a report that reveals the US has disclosed details of only 20 percent of its lethal force operations in Yemen, Somalia, and Pakistan since 2002. The report notes that, as of June, the US has carried out at least 90 airstrikes in Yemen in 2017 using drones, aircraft and missiles. These strikes have led to at least 81 deaths, including 30 civilians. June 22: HRW releases a report documenting how “the UAE supports Yemeni forces that have arbitrarily detained, forcibly disappeared, tortured, and abused dozens of people during security operations,” while also running secret prisons in Aden and Hadramawt. The report says HRW has further document “scores” of cases in which Houthi-Saleh forces have arbitrarily detained and forcibly disappeared people in the country’s north and abused prisoners. July 26: A team of UN investigators accuses the Saudi-led military coalition of having killed 43 people in March during an attack on a boat of Somali migrants off the coast of Hudaydah. Investigators add that the coalition has become a cover for the nations involved to avoid individual blame for war crimes. August 1: The UNSC subsidiary sanctions committee on Yemen receives its midterm report. Among the report’s findings are that Saudi-led military coalition forces have not reported cargo ship inspections since UNSC Resolution 2216 was adopted more than two years ago, contrary to the coalition’s obligations under the sanctions regime. Other findings include that all belligerent parties to the conflict regularly violate international humanitarian and human rights law, and that individual coalition member states are using the coalition as an umbrella to protect themselves from being directly implicated in war crimes. August 9-10: In two incidents over two days, human smugglers piloting boats off the coast of Shabwa governorate force overboard a total of 280 Ethiopian and Somali refugees, resulting in the drowning of more than 40 people. August 16: A confidential UN report, leaked to the press, recommends that the Saudi-led military coalition be added to the UN black list of countries that “kill and maim” children in armed conflict. The report states that the coalition and Houthi forces were together responsible for killing 502 children and injuring 838 in the previous year. August 23: A Saudi-led coalition airstrike near Sana’a city hits a hotel in Arhab district, killing at least 41 civilians, including women and children. Two days later, another coalition airstrike in the southern district of Faj Attan, Sana’a governorate, kills 14 civilians and injures 16 others, with at least five children among the dead. September 11: For the third straight year, the UN High Commissioner for Human Rights Zeid Ra’ad al-Hussein reiterates his call for the UN Human Rights Council (HRC) to establish an independent international body to investigate violations of human rights and international humanitarian law in Yemen. September 29: At the 36th session of the HRC in Geneva, a resolution is adopted to establish a group of eminent international and regional experts to investigate human rights abuses in Yemen since September 2014. November 1: Saudi-led military coalition airstrikes hit a market and a hotel in the Sahar district of Yemen’s Sa’ada governorate, killing at least 31 people, including 6 children. November 4: Houthi forces launch a Scud missile at the King Khalid International Airport in Riyadh, targeting civilian infrastructure. November 6: The coalition announces it is closing all land, sea and air ports into Yemen to commercial and humanitarian traffic. December 4: The UN High Commissioner for Human Rights Zeid Ra’ad al-Hussein announces the appointment of the three members of the experts group on human rights violations in Yemen, established by the HRC in September. December 6-26: The Saudi-led military coalition kills 231 civilians, including dozens of children, and injures 162 in airstrikes on hospitals, markets, farms, a TV station and a prison, according to OHCHR reports (see here and here). While the strikes took place across northern Yemen, civilian casualties were concentrated in Sana’a, Sa’ada, Hudaydah and Taiz governorates. December 31: As 2017 ends, at least 15 journalists remain held in Houthi jails, some having been detained since 2015. The Sana’a Center for Strategic Studies would like to sincerely thank all the people who have contributed to the publication of Yemen at the UN in the year 2017. They are, in alphabetical order: Ola Abdulla, Ziad Al-Eryani, Tawfeek Al-Ganad, Hamza Al-Hammadi, Maged Al-Madhaji, Osamah Al-Rawhani, Sala Al-Sakkaf, Aisha Al-Warraq, Wadah Alawlaki, Waleed Alhariri, Nickolas Ask, Yaaser Azzayyaat, Adam Baron, Anthony Biswell, Isadora Gotts, Marcus Hallinan, Alex J. Harper, Maxwell Jenkins-Goetz, Raed Khelifi, Michael McCall, Amal Nasser, Spencer Osberg, Mansour Rageh, Victoria K. Sauer, and Olivia Segal. 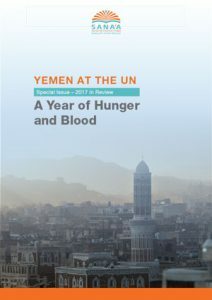 Yemen at the UN / Special Edition – 2017 in Review was developed in partnership with the Friedrich-Ebert Yemen office.